Please explain why computers are important for students. When Bill Gates of Microsoft dreamed of having a computer on every desk and in every home, he did not realized how fast things can go. Today, virtually all young people have their own computers, especially students. The reason behind it is simple. Computers bring convenience to people’s life. There is no need to look up the newspaper for jobs and internships; all you have to do is a click of mouth. Besides, students can make friends with similar interest and passion by using computer-based social networks. In this way, they are well informed about the latest development in their researching area. Is it always good to keep honesty? In my view, honesty is the best policy. Friends are to be trusted. When choosing friends, I would consider honesty as the top criteria. Sometimes, we may be worried about hurting other people, for the truth is cruel. However, it is far better than the feeling of getting cheated. The same goes for acquaintances or strangers as well. No one likes dishonesty. A company will sooner or later go bankrupt without credibility. A country lacking of the quality of integrity will be looked down upon. A person short of frankness is not trustworthy. The university launches a Clean Campus Program, advocating students to participate in and clean the campus by groups. After the activity, a party will be held for those volunteers. The man holds a positive idea. He thinks the activity can not only make the campus cleaner but also arouse the students’ environmental awareness. Besides, he thinks the ensuing party is super cool, for it may attract more volunteers and give them encouragement. The reading passage discusses the skill of ‘stimulus reduction’, which keeps people from getting distracted. 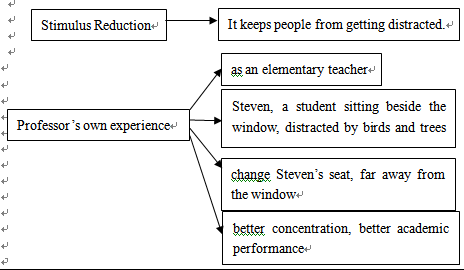 In the lecture, the professor illustrates the concept with his own experience. Once being an elementary school teacher, he found that one of his students, named Steven, who sat beside the window of the classroom, was always distracted by the birds and trees outside. So he changed Steven’s seat to a place far away from the window. This greatly improved the kid’s concentration in class and helped him achieve academic excellence. ＝> problem: The man has an important drama performance tomorrow. His partner happened to be ill and cannot make it. he has another performance next week. She may overcome her illness. he can finish both performances. The man is faced with a problem: one of his stage partners is sick but the performance is important. The woman suggests him to explain to the professor and asks him to rearrange the time, but the man says that he will have another stage performance next week and it will be hard for him to memorize two story lines together. Another suggestion is that he may ask his partner, Sarah, to come in spite of the illness. In my view, the second suggestion is better. The man should ask Sarah to come if he really needs her help. She would understand that. 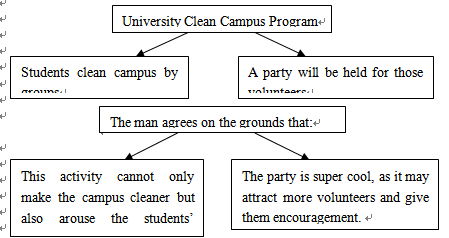 The lectures introduce two types of social groups. On the one hand, there is the group with interactions, for example, group of elephants. Whenever one of the elephants is sick, others will take care of it, bringing water, food and even nursing its baby. 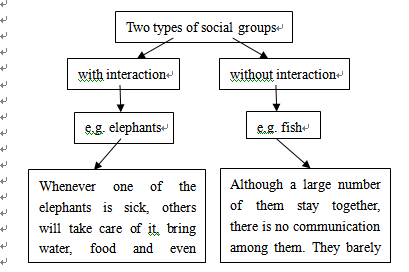 On the other hand, there is the group without interactions, for example, fish groups. Although a large number of them stay together, there is no communication among them. They barely know or help each other.